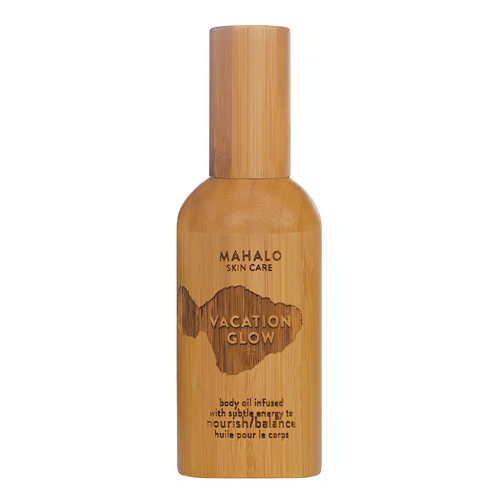 The Vacation Glow Hair + Body Serum by Mahalo Skin Care is a decadent and lustrous beauty oil for the body and hair. Infused with tropical flower oils and subtle energy from the island of Kaua'i, applying a veil of this blend not only makes skin and hair feel ultra soft, but transports your senses to an uplifted, joyful and peaceful place. Macadamia, kukui and avocado oils combine with sea buckthorn and COQ10 to offer a feeling of restoration and hydration to skin and hair, while imparting a look of its signature Vacation Glow. After a shower and while skin is still damp, pump the golden oil into the palm of your hand and smooth over fresh skin for to moisturize and give skin a look of healthy glow. Breathe deeply and massage onto skin to enjoy a feeling of warmth, a sensation of releasing energy blockages, and a sense of ease and comfort to the body and mind. Vacation Glow is infused with subtle energy that lends a supportive feeling of well being.